Our client was a Fortune 500 company specializing in network storage. The target audience was executives in large organizations who buy or specify backup storage solutions to secure enterprise data and restore it if necessary. Much of the audience still uses backup-to-tape, a slow but dependable process which has been around since the early 1990s. We wanted to convince them to learn about our client’s backup-to-cloud solution and become sufficiently interested that they would agree to a demo. Our approach was to talk about “surviving backup to tape” and focus on all the challenges that might make life difficult for the manager using that solution. 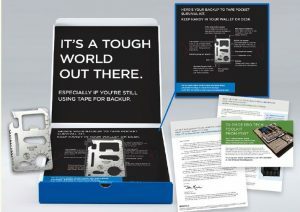 A dimensional box teased “Pocket Survival Kit Enclosed” with the subhead: “Are you still using tape for backup? Then you’ll need this.” Inside, the prospect found a credit card-size pocket tool with screwdriver, bottle opener and similar capabilities. The gadget was mounted on a shelf with callouts to the functions that tied them to the hazards of tape backup. We were able to complete more calls—35% more per hour than projected, indicating the prospect was interested enough to take the call. 40% more scripts were presented per hour than plan. And, most important, 65% of completed scripts were converted to demo appointments, vs an anticipated 10%. Eleven people referred us to someone else in their organization who is responsible for tape backup, and of those 5 became qualified leads with a demo scheduled. We have found that you only get those kinds of valuable referrals if you’ve done a very good job of presenting the value proposition to the original recipient and they are enthusiastic enough about the solution to refer you to the decision maker. Anecdotally, the telephone reps told us the people they talked to were highly engaged, remembered the direct mail and offer, and were eager to talk about it. They found the “Ultimate IT Geek’s Toolkit” an appealing reward for their time in taking the demo, and they appreciated the research we had made to match the premium (a set of jewelers-quality tools used for tinkering with electronics) to their interests. Results: at the five-month mark, two hundred and thirty demos had been scheduled vs plan of 42—a 5x improvement over our goal. Beasley’s involvement ends here, since our assignment was to deliver a sales-ready lead to the client’s reseller network. Based on conservative estimates and extensive previous experience with similar campaigns, we project a sales-to-cost ratio of $4.62 in revenue for every dollar invested. By any measure, the campaign is an outstanding success. How can our direct mail experts help your next campaign succeed? Call and speak with us today.